From labs to the classroom, learners got to experience all aspects of being a scientist at UKZN. 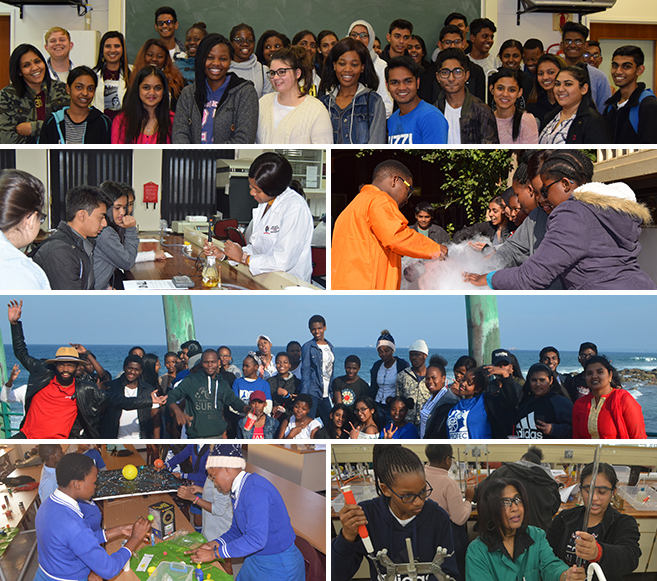 The College of Agriculture, Engineering and Science (CAES) recently held its fun and interactive “Be a Scientist for a Week” programme aimed at Grade 10, 11 and 12 pupils. Held on the Pietermaritzburg and Westville campuses, the event was attended by over 70 scholars from across KwaZulu-Natal who interacted with staff and students and learned about the University’s facilities as well as science career opportunities. In Pietermartizburg, learners interacted with representatives from the Schools of Life Sciences, Mathematics, Statistics and Computer Science (SMSCS) and Chemistry and Physics (SCP). Distinguished Teacher Awardee, Professor Gueguim Kana, and his postgraduate students introduced the subjects of fermentation and virology processes. Mr Sicelo Goqo from SMSCS taught learners how to do multiples using only 10 fingers and SCP staff and students had taught them how to make various flavours of ice-cream using liquid nitrogen. The pupils were also taught about bacteria. Career Development Officer, Ms Karuna Mahadave, conducted a Keirsey Temperament Sorter personality test with the group to identify their personality types and aptitudes. The week also involved visits to the Animal House on campus with Mr Ebrahim Ally where learners saw snakes shedding their skin, guinea pigs, various birds, mice, terrapins and more. The scholars conducted an experiment guiding mice through a maze with various treats at the end. Learners were also taught how to extract DNA from onions. In the Discipline of Genetics, participants learnt about different diseases; playing a game where the winners walked away with prizes of non-infectious strains of malaria in test tubes. Microbiologists also taught learners how to find patient zero, demonstrating how diseases spread and how microbiologists identify a disease carrier. The week concluded with a day at WESSA’s Umgeni Valley facility that included team-building activities between the Wildebeest and Zebra teams who competed in an active quiz based on environmental questions, an obstacle course and a treasure hunt before being awarded with their certificates. In Westville, the School of Life Sciences hosted learners for an entire day. Talks were delivered by representatives from Medicinal Plants, Plant Taxonomy, Plants and Climate change, Marine Biology, Microbiology, Genetics and Biochemistry. Students conducted practical demonstrations at the Microscopy and Microanalysis Unit. Dr Tanya Reinhardt from the School of Agricultural, Earth and Environmental Sciences wowed learners with interactive geological games and displays at the Science and Technology Education Centre (STEC@UKZN). The School of Chemistry and Physics gave learners an informative demonstrations and presentation by Mr Ajay Bissessur. Learners also visited all the Chemistry labs and conducted their own experiments. Dr Mathew Moodley gave a gripping talk on being a physicist. The School of Engineering spoke to the learners about their respective areas. Learners also visited the SMART grid centre and the Vibration Research and Testing Centre (VRTC). The School of Mathematics, Statistics and Computer Science was represented by Dr Kanagaratnam Arunakirinathar, Ms Nombuso Zondo and Mr Edgar Jembere respectively. Learners built solar systems with Ms Precious Sikhosana from the Astrophysics and Cosmology Research Unit (ACRU). Learners also underwent career guidance and assessments with College counsellors, Ms Prashna Singh and Ms Ronelle Msomi. Ms Londi Mkhize from the eThekwini Municipality: Human Settlements, Engineering, Transport Authority Cluster and Trading division, gave learners an insight on various bursaries available to students attending UKZN provided by the eThekwini Municipality. After an intensive week of exciting sessions, learners were treated to a field trip to the Dube Trade Port- AgriZone where they were exposed to high-tech agriculture facilities. Thereafter, learners were awarded certificates of participation.